Subway is testing a bun made of egg whites, corn starch and tapioca starches for customers with gluten sensitivities at 700 outlets in Dallas and East Texas. 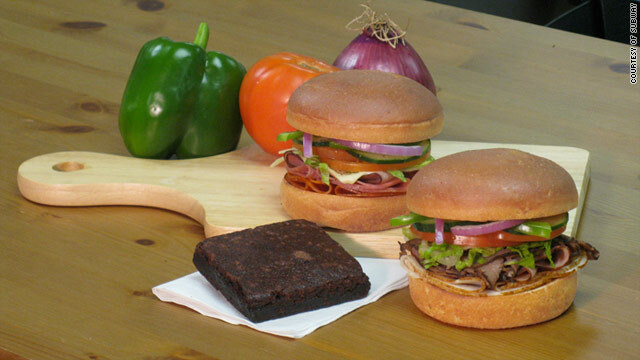 The sandwich chain is also offering a gluten-free brownie for dessert. The brownie is made of potato starch, cocoa and sugar. With Subway exploring a wheat-free alternative, is this a sign that major food chains are paying more attention to gluten sensitivities such as celiac disease? Scott Adams, founder of celiac.com hopes so. “Increasingly, restaurants are paying more attention to people with celiac,” he said, also listing Outback Steakhouse, Bonefish Grill and P.F. Chang’s. People with celiac disease, a digestive condition that damages the small intestine and interferes with absorption of nutrients from food, often have trouble finding food without gluten when eating at restaurants. To varying degrees, they cannot tolerate gluten, a protein in wheat, rye, and barley. Eating out with celiac disease “used to be hard,” Adams said. He’d go to a food court and basically stick to white rice and stir fry (without soy sauce – because it contains gluten). Celiac disease is a common genetic disorder that affects about 1 in 133 people. Fast food chains such as Taco Bell, Arby’s and Wendy’s offer lists of allergens. In January, Subway started testing a gluten-free, deli-style bun that arrives to stores pre-packaged. The sandwich makers are instructed to use a one-time use knife to prevent cross-contamination with gluten products. The buns are baked at a separate facility. “Being able to have the option to go into quick service restaurants such as ours gives more people options. It gives them that feeling that they’re not so limited,” Winograd said. There are no plans to expand the gluten-free experiment nationwide at this time, he said. Subway is also testing a diabetes-friendly menu test in the Midwest, opening a few locations in the U.S. that serve kosher menus and serving halal foods in Europe. « Previous entryDo vitamins help against type 2 diabetes? I had been browsing more than google and so i discovered your internet site. Effectively actually saying I like your internet site plus your internet site design. I look a lot of web sites plus they will not appear so easy to use and shade you might be working with it suites your web site. Carry on doing it.